Bhutan was on my mind a lot. Every time I saw a story about the handsome king, the upcoming elections, and the Gross National Happiness, my resolve to visit the Land of the Thunder Dragon got stronger. Last year, I finally scrambled the cash together, and a couple thousand dollars later, I was a proud owner of a plane ticket on Druk Air – Royal Bhutan Airlines. Bhutan ain’t cheap, that’s for sure. Every visitor pays a daily tourist fee set by the government, which means that only the truly determined, or very rich, make it there. There are no budget options and no hordes of shoestring travelers prancing around the countryside. Poor foreign folk stay in India or trek in Nepal. Bhutan is for the few chosen ones… And few it is, indeed. In 2007 only 17 thousand people visited the country, and this year the number is expected to be just a bit over 20 thousand. However, with the US dollar getting weaker, 200 bucks a day in the high season suddenly doesn’t sound so bad. Especially since the cash covers all of your standard accommodations, food, transport, plus a guide and a driver at your beck and call. There’s also a hefty surcharge for solo travelers, but that only means you have two strapping young men, ready to cater to your every whim and desire, all to yourself. 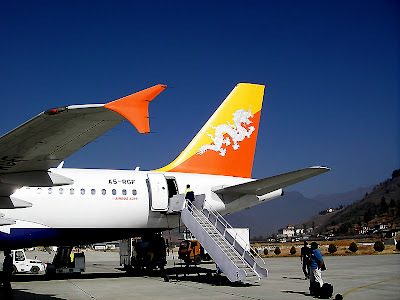 So why, with all the places in the world, many of them cheaper and much easier to get to, I insisted on going to Bhutan? Well, for one, their king, Jigme Singye Wangchuck is hot. Like a combination of Chow Yun Fat and Ken Watanabe hot. 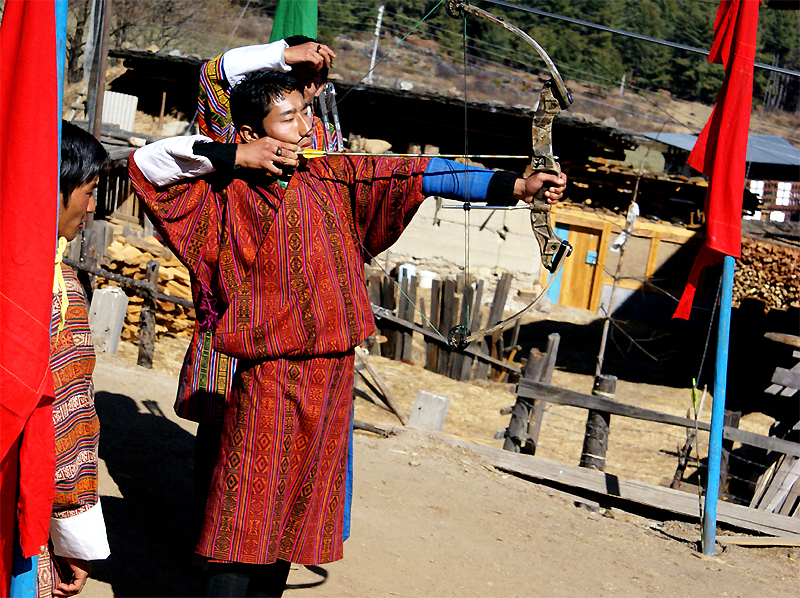 Of course, as a huge fan of both, I felt the irresistible urge to check out the rest of the Bhutanese male population. Even if it had to cost me US$165 a day - the low season discount. Yes, I’m THAT shallow. 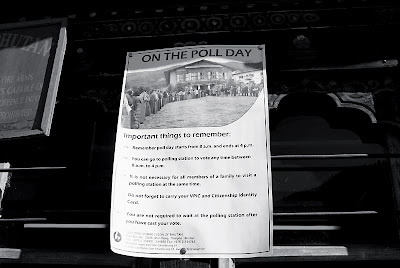 But the breakneck speed of social changes in Bhutan, and the fact that the country is soon to become a democratic, constitutional monarchy were just as fascinating as the studly king himself. So the verdict? Social issues aside, the Haa Valley peasants were simply extraordinary. And very photogenic. Handsome men, looking mighty fine in their ghos (traditional outfits) and knee-high socks, having an archery competition a sunny afternoon. And showing off their mad skillz for the benefit of a lonesome foreign lady in their midst. The last Shangri-La, indeed. 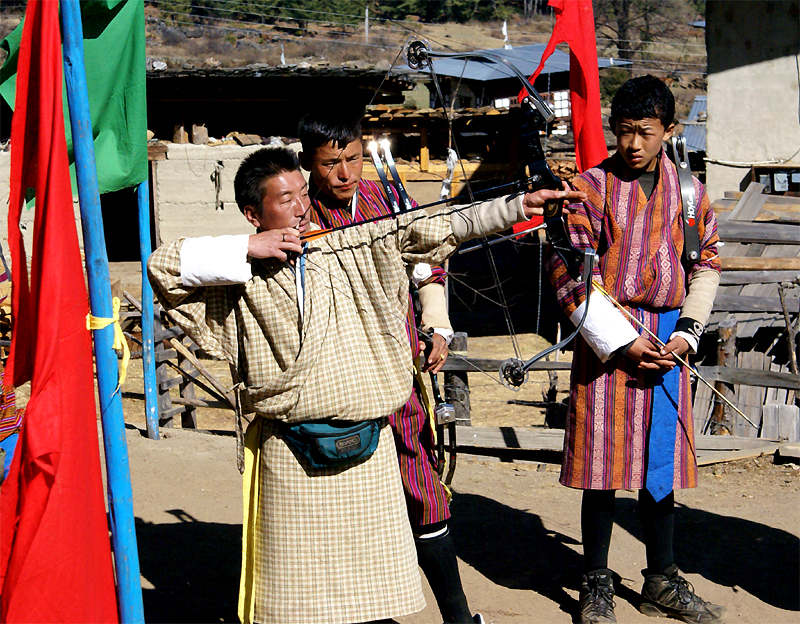 Archery is the national sport, and seemingly, even the poorest farmer is a proud owner of a fancy imported Hoyt bow. Judging by the warning in the Lonely Planet guidebook, that romantic liaisons between female travelers and Bhutanese men are common, and the fact that many a tour guide actually married their foreign tourist lady, the appeal of handsome peasants was not to be taken lightly. 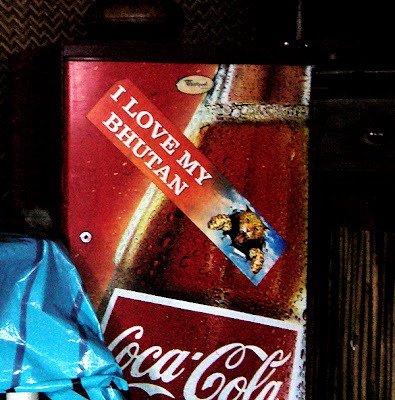 But with the reputation of every foreign woman going to Bhutan resting on my shoulders, I simply smiled, shook my head and stayed proper.